A sensitivity or allergy to petroleum can be a major problem because petroleum and its derivatives are present in many everyday products. Most petroleum-related allergies are respiratory in nature because the inhaled vapors are potent and even toxic to some people. If a petroleum allergy is suspected, consult your doctor to determine the severity of the allergy and learn how to manage and treat it. 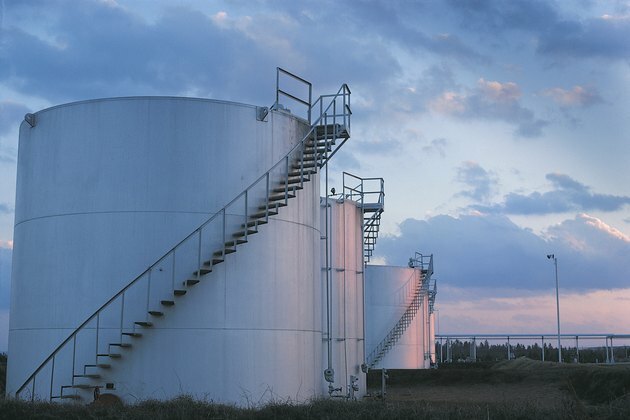 Petroleum distillates are refined from crude oil and include gasoline, kerosene, paraffin wax, and tar. According to the Consumer Product Safety Commission, these potentially toxic ingredients are the basis of many consumer products, such as furniture polishes, paint solvents, adhesives and chemicals used in the automotive industry. Another group of petroleum-based products includes benzene, pine oil and turpentine, found in household and painting products, among other things. Many cleaning fluids, pesticides and shoe polishes also contain petroleum derivatives. Exposure to any products containing petroleum can prompt reactions in those with allergies. Initial symptoms include watery eyes, runny nose and itching in the mouth and throat, according to the Medical University of South Carolina. Skin reactions may also occur, including itching, redness and rashes. Respiratory reactions are serious and include sneezing, wheezing and trouble breathing. Such symptoms warrant immediate medical attention. According to the Ecology Center, petroleum and its by-products can cause illnesses more serious than just allergies. The toxic effects of petroleum products on the human body have been linked to serious respiratory conditions, disruption of the endocrine system and developmental problems in infants exposed before birth. Some EPA studies also suggest the petroleum distillates in pesticides, sometimes ingested in food products, can be linked to some cancers and disturbances of the nervous and reproductive systems. Because it is difficult to pinpoint the exact product causing a petroleum-related allergy, such conditions are often lumped under an umbrella condition called multiple chemical sensitivity syndrome, or MCSS. MCSS is used to categorize environmental sensitivities to products ranging from gasoline to cleaning products. Allergic-type reactions, including respiratory and skin irritations, are typically the initial signs that you suffer from MCSS. More research is needed to determine the exact triggers for MCSS and identify those people who are most susceptible.